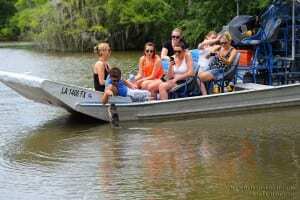 Airboat swamp tours are truly a blast! They ride in inches of water and go where traditional boats cannot. The airboats were designed to take you to inaccessible areas of the swamp…places that cannot be reached by foot or car. It is a unique experience. We can add two additional hours for a lunch stop at a local restaurant only 10 minutes from our dock. The hourly charges will vary on type of vehicle needed for the group. We would use a 6 passenger airboat & a Black Exec Van that sits 11 passengers. The driver will arrive at a predetermined location. The driver would bring an empty ice chest and can stop at a store for the group to purchase refreshments. We would use a 16 passenger airboat and a minibus that sit 14 passengers. The driver will arrive at the predetermined location. The driver will bring a large Ice Chest or two small ones and will stop at a store for the group to purchase refreshments. We would use a 16 passenger airboat and a 23 passengers minibus. Driver brings two ice chests and can stop at a store for the group to purchase refreshments. We would use (1) 6 passenger airboat & (1) 16 passenger airboat that will sit a total of 22 passengers. We would use a 23 passenger minibus with two large ice chests. One pick up location. We would use (2) 16 passenger airboat & a 33 passenger minibus with two large ice chests and the driver can stop at a store for the group to purchase refreshments. One pick up location.